Hello everyone! How are you all doing??? I'm not sure what I did, but last week when doing some neck exercises I heard and felt a large "pop". After a few days the extra stiffness the pain kicked in. It feels a little like my shoulders/neck did right before I had my neck surgery, but without the migraines it was causing. I'm waiting to hear back from my Dr as to what to do next, but I feel like I'm carrying 50 lb bags of sand on my shoulders and neck. Let's get to my card. 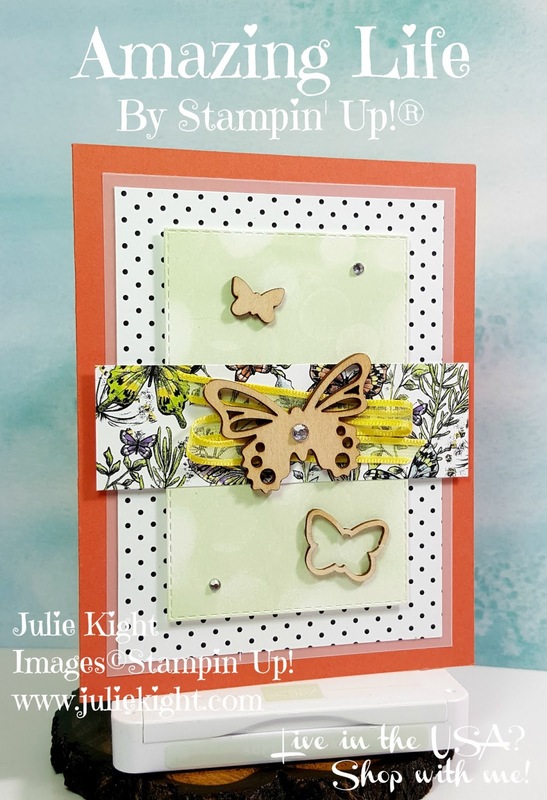 Today I have a card I made with a few of the Stampin' Up! Sale-A-Bration items. Can you pick them out? Ok...I used three different items in this card, the Butterfly Elements, Botanical Butterfly DSP (Designer Series Paper), and the Organdy Ribbon Combo pack. 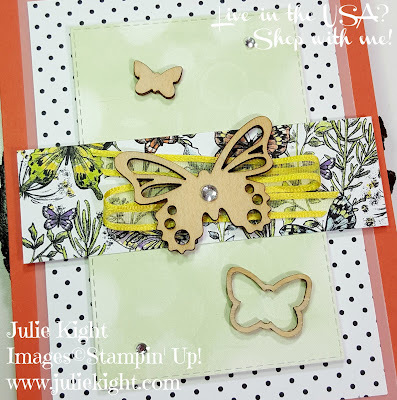 Now since I made this card Stampin' Up! told us in the North America market that the Organdy Ribbon is on non-orderable status due to the fact of how popular it is and will not be available again until March. 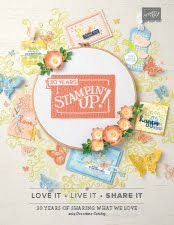 But everything else IS available and you can get each item or any of the Sale-A-Bration item with every $50, before tax & shipping, you purchase. 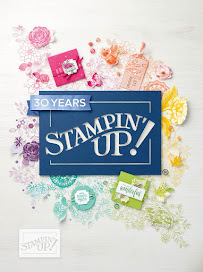 I wanted to let all the Sale-A-Bration items shine the most on the front so the only stamping I did was with the Bokeh stamp to provide the background in Soft Sea Foam. 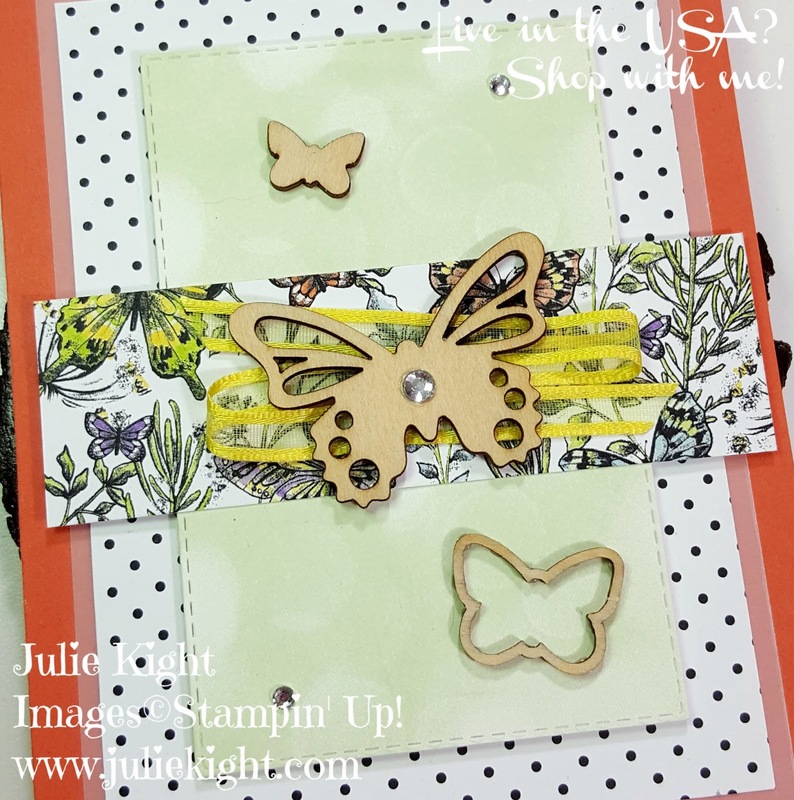 I used my Stamparatus to line the Bokeh stamp up so I could stamp it twice...right underneath each other. I kept the inside very simple with a sentiment and a few simple flowers from the same set. I hope you enjoyed my card and see you on my next post! Have a great weekend.